But first I’ve got the RootsTech Run down for you. Last week I spoke at RootsTech 2015 which was really a two-fer conference of both RootsTech and the Federation of Genealogical Societies national conference. So needless to say it was bigger than ever. If you didn’t attend, why should you care? Because FamilySearch which is the organization behind RootsTech has really, and I mean really, upped the family history game if you will. Even though they are a non-profit, they are really leading the industry, and having a huge impact on the types of genealogy resources and services that are being developed, which directly affect your family history research. And “Family History” is the key phrase there. At a FamilySearch VIP event I attended the leadership made a point of saying there is a distinct difference between genealogy and family history. We may often use these terms interchangeably, but they made this point with purpose, to drive home the fact that they are concerned with more than just genealogy; the building of your tree and tracing of your lineage. They are extremely focused on “family history”, and from what I know about you, you are too. Family history is the holistic approach – the stories, the photos, the legacy you are creating through your research. It’s not that its critical which words you use, but I think they focused on the distinction to really help the community understand what their focus is. as well as Donny Osmond, and American Idol star David Archelta. There were some negative comments about these choices floating around on social media before the conference, but for anyone who attended and saw the presentations it all made perfect sense. They all spoke, and sometimes sang, to the heart of family history. I know for all you listening, your heart is certainly in it. They offered incredible inspiration and I think everyone walked away rejuvenated and recommitted to their research. And research just isn’t the right word. They came away motivated to continue on the legacy of family history they are building. And really that is the job of the keynotes. To set the tone and inspire and motivate, because there were plenty of indepth classes and a huge variety of topics to fulfill the educational component of why we attend conferences . FamilySearch, which was formerly the Genealogical Society of Utah, celebrated its 120th birthday last fall. It now operates 300 cameras in 50 countries around the world collecting digital genealogical sources. They released two mobile apps in 2014, FamilySearch Tree, the mobile companion to Family Tree on the FamilySearch website, and The Family Search Memories app which helps you collect, preserve, and share your favorite family photos, stories and spoken words. They are launching a new indexing program which will be part of the FamilySearch website which can be used on most desktop computers, notebooks and tablets. And to give you an idea of the scope of FamilySearch Indexing , there are 321,000 volunteers who have indexed 160 million records in 2014 alone, bringing the total of records indexed to 1.26 billion. These are records being made available to all of us free on the familysearch.org website. In June of 2014 FamilySearch surpassed publication of 1 billion images. It took 7 years to get there and the billionth image was published in FamilySearch’s growing collection of Peruvian records. IF you consider that a single digital image can have several historic records on it, that means there are actually billions of record images on FamilySearch. FamilySearch projects that it will take just 3 to 5 years to publish the next billion images. And as for new record collections, in 2014 FamilySearch published 38 million obituaries, 10 new Freedmen’s Bureau field office collections, and new and updated collections all around the world. One of the coolest things they unveiled is their new Discovery Centers. This is something that they announced last year, and our contributing editor Sunny Morton got a chance to go through the one in the Joseph Smith Memorial Building in Salt Lake City while at the conference. Here is a link to her blog post. The FamilySearch Discovery Center is focused on offering families simple and powerful in-person family history experiences. Each visitor gets a unique, personalized experience where they learn about themselves and where their family came from, and how they lived. They can even record a video about themselves or a family member. You’re in luck if you live in the Seattle area because a center is expected to open there in June of 2015. The two centers will serve as a testing ground to fine tune the centers and then open more around the world. So while I was at the conference I presented three classes for FGS which included using Evernote for Genealogy which was a packed house, using criminal cold case strategies for your brick wall genealogical cases, and video marketing for genealogy societies. For RootsTech I taught Turn your iPad into a Genealogy Powerhouse and, and building a genealogy business which was for the Rootstech Innovator Summit. And of course we had the Genealogy Gems booth in the massive expo hall where we teamed up with FamilyChartmasters, The Photo Detective and Family Tree Magazine to once again present our Outside the Box booth sessions where folks could join us for ½ hour session on topics like Google Search, Evernote and a whole lot more. The time period after the U.S. Civil War is a messy era for searching for African-American ancestors from the South. Millions of people were emerging from slavery, without documented histories of who they were or who they were related to–many without even consistent first and last names. A new website helps researchers locate important African-American genealogy resources from the post-war Reconstruction era. Mapping the Freedmen’s Bureau is a map-based tool for helping you find the Freedmen’s Bureau offices and hospitals, Freedman’s Bank offices, “Contraband Camps,” U.S. Colored Troops battle sites and other locations nearest your ancestors that may have created records about them. Many of these record sets are just coming online or are newly indexed and are free to search, so the timing couldn’t be better. What it is a fantastic tool! I’m so pleased to see this site. Now those who know what location they’re starting with can easily glance at a map and click to see which of these resources exist in a specific locale and where to find them online or offline. Listen to my interview with African-American genealogy research expert Deborah Abbott, PhD, in the FREEGenealogy Gems Podcast episode 159. “Danish national censuses, including approximately 9 million images and 31 million records, covering the years of 1787 through to 1930. One of the most enlightening sources of historical content, census records provide a glimpse into a family’s past listing information about each household including the names of occupants, information on residence, ages, places of birth and occupations. According to MyHeritage, “The records, spanning almost 300 years, provide a window to the lives of Danish ancestors during fascinating periods in history including the Napoleonic wars, liberalism and nationalism of the 1800s, the Schleswig Wars and industrialization. “The records will illuminate the lives and times of noted Danish historical figures such as Kierkegaard and Niels Bohr. Celebrity fans will be able to look into the family history of Danish Americans such as Scarlett Johansson and Viggo Mortensen for clues on their success. Many of the records will be made available on MyHeritage as early as April 2015 and the rest will be added during the year. Just one more reason we at Genealogy Gems are pleased to have MyHeritage as a sponsor of the Genealogy Gems podcast. From Judy: "After reading your message about "getting materials back home", I thought I'd share something I've begun. Because of working on family genealogy, I have become the recipient of several family items. We have no children, just a niece and nephew who do not live nearby. So...To make sorting things easier for family at the end, I've begun a photo album with pictures of family heirlooms with a message included that tells whose item it was or who made it and/or a story about why it has been special. I'm in hopes that at least they can try to find and save these items instead of trying to guess or having to take the time to go through all of the family binders where most are also recorded." From Sharon in California About Nov. 13 newsletter: "Lisa, in today’s email you talked about walking through your front door and seeing things differently. 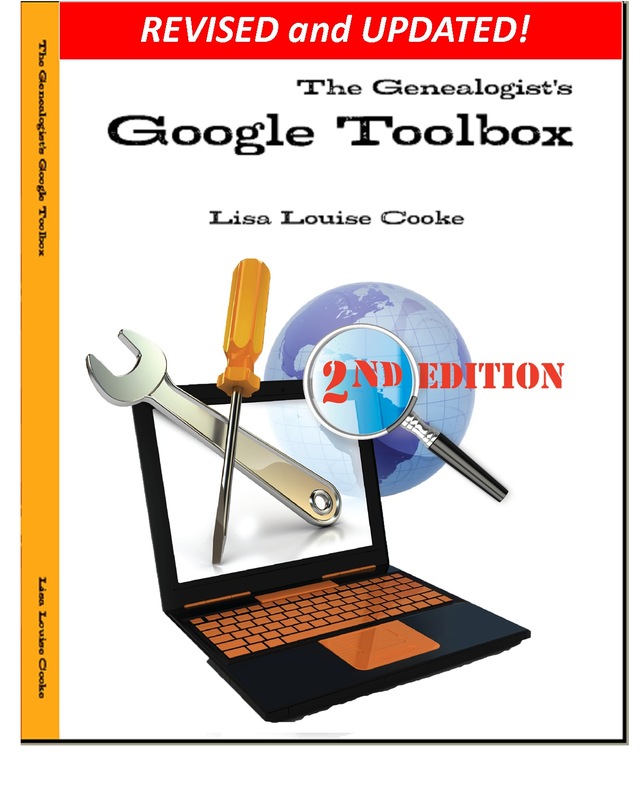 Since you are a big fan of Google and Google Maps, I wanted to tell you about a speaker that we had at our San Ramon Valley Genealogical Society meeting one time who talked about using maps in genealogy. And he said the first map we should use is the map of our house. I thought that was a little Silly, until I thought about the first house I remember, when I was 3 or 4 years old (and I’m now 74). As I walked up those stairs to our apartment, I remembered so many things about that house. As I “mapped” the layout of the house, each room brought back Memories. Memories of my bedroom where when I had measles and my Dad brought me little Scotty dog magnets and we played with them on my bed. In the kitchen, where my Mom taught me to eat vegetables that I didn’t like by piling on the butter. The back porch where the ice Man delivered blocks of ice. And many, many more. Each house, and it’s map brought back individual memories. Maybe this isn’t genealogy, but it is family history, or maybe only MY history, but it was fun going through all those memories." From Deanna: "I was very touched by the story of your husband's relative whose mother took her own life due to what sounds like depression. I have a loved one who has anxiety and depression, and I am so thankful we live in a time where education, resources and medical options are available to assist those who are struggling. I am also thankful for your podcast, Genealogy Gems, which was a great source of encouragement to me during a difficult season of being the caregiver of my struggling loved one. The research tips inspired me to keep looking for those elusive ancestors, and the many stories reminded me that most life journeys have difficulties. Most importantly, however, I was reminded that we humans are quite resilient. Thankfully, my loved one is doing much better now, yet I still look forward to each and every Genealogy Gems podcast. In addition, I am planning on attending the upcoming seminar in Vero Beach, FL, which is being hosted by the Indian River Genealogical Society. Although it's a bit of a drive for me, I couldn't miss seeing you in person! Thank you for all you do, and may God bless the life journeys of you and your family!" Our current featured book, Orphan Train by Christina Baker Kline, is getting some nice thumbs-ups from Genealogy Gems readers. Just to catch you up, this is the story of two women. It starts with Vivian, an Irish immigrant child who loses her family in New York City and is forced to ride the ‘orphan train.’ She’s placed with several different families across the Midwest, with different results, but it’s the same premise at every home: her life starts over fresh there, with new rules and expectations and little or no recognition of her past or personality. After following Vivian’s life through her childhood and young adulthood, we fast-forward. Vivian is 91, and a teenage girl named Molly comes to help her clean out her attic. Molly is a Penobscot Indian who is in the modern foster care system. On the show, I read a passage from when Vivian meets Molly. On first glance, they are so different: an old white lady with money and a Native American teenager without resources. Molly immediately judges Vivian. But Vivian’s response totally disarms her. And that’s when it starts to get fun. I hope you will have a chance to read Orphan Train before our interview with Christina Baker Kline next month! I think a lot of people make genealogy goals at the new year: goals like writing up your research. I’ve noticed that one of things people often stumble over when they try to write family history is what style of writing to use. Do they want to write like a college professor, scholarly and objective? Or should their personal feelings and opinions be part of the story? Or, even more nontraditional, should they fictionalize their ancestors’ stories like a novel? My book recommendations this month are three published family histories—all fascinating reads—that happen to be examples of different kinds of writing. Mordecai: An Early American Family by Emily Bingham is perhaps the most engaging scholarly family history I’ve read. It’s based on thousands of letters and other documents that make me just go green with envy—like, how did she FIND that document??? There are more than 50 pages of endnotes. I don’t think the author is related to the Mordecais. My sense is that she’s a historian who came upon a gold mine of a family, in terms of documentation, personality and themes she saw emerge down the generations of this family. I do like to read well-written scholarly history, especially about families and religion. I am fascinated by how religious beliefs make people tick, and their effects on family and community life, especially for a family like the Mordecais who belonged to a marginalized faith at that time in U.S. history. On the show I read the opening paragraph of the introduction, to give you a sense of her voice. Many of you may have read Family by Ian Frazier, which came out several years ago and was popular among genealogists. Ian also wrote the best-selling books On the Rez He’s an expert observer, insightful, compassionate, funny and honest. So it’s no surprise he also uses a first person voice, or the use of “I” when writing about his explorations into family history. On the show I read a passage from page 9 where he is writing about his ancestor’s hometown of Norwalk, Ohio, and we compare how different his voice is, but how effectively he wraps together his own experience with his research. The Worst Country in the World by Patsy Trench is a first-person narrative about her Australian ancestors, who were among the first European settlers in that fascinating country. Patsy actually quit her job and traveled from London to Australia several times to research the story of her fourth great-grandmother and other relatives. She describes the book she wrote as “a hybrid: part family history, part memoir, part novel. The skeleton of the story…is as true as I could make it…. But I have put flesh on the bones, invented personalities for real people, circumstances behind the facts, all in the cause of turning my family saga into what I hope is an entertaining read. The dramatised scenes are from my imagination but the outcome of them is fact.” (Introduction, page 5) She cares a lot about her research, so she tries to make it clear in the text what’s based on evidence and what’s speculation, and she includes a detailed appendix that spells out where she took liberties. On the show I read a passage from page 86 about something her ancestor may or may not have done upon her arrival in the colony. You can hear the author’s playfulness as she openly decides to buy into an unsubstantiated account for the purposes of good storytelling. Then she tells a good story, and we have a sense of the setting, other characters, social life and current events in her ancestor’s new life in Australia (whether or not that specific incident actually unfolded as it did). All in all, these three books—great reads in and of themselves—are also great examples of the different kinds of storytelling methods and voices we might choose to adopt when we write about our ancestors’ lives. Happy reading from the Genealogy Gems Book Club! Family history organizations and studies based on individual surnames have been around for years. They are now integrating YDNA research into their efforts. Use surname projects to enhance your paternal DNA research! Surnames are the flagships of our genealogical research. We name our files after them and we tag our research with them. We wear our last names proudly on pins and necklaces and T-shirts. But surnames can also be misleading. Illiteracy, language barriers, and just plain carelessness led to misspellings and alterations, not to mention those ancestors who blatantly changed their name to avoid detection. The advent of YDNA testing has changed the way many genealogists view surnames and their role in their genealogy. Because a man’s YDNA is the same as the YDNA carried by each of the ancestors in his direct paternal line, the YDNA can act like a filter, clearly indicating which men with a particular surname, or variant, truly share a direct paternal line. So how has YDNA testing affected family organizations that do surname research? I asked Debbie Kennett, a regular contributor to the International Society of Genetic Genealogy Wiki and Facebook page who is also involved with the Guild of One Name Studies. The Guild of One Name Studies was established in 1979 to promote public understanding of one-name studies and preserve the information obtained by those studies. Jean Morrison, a member of the Morrison surname project, says that because of DNA testing, “identifying where in Scotland this family originated prior to coming to America ca 1728 has become a realistic goal. The Morrison Q Group has identified through Y line testing at 111 markers, 22 individuals with an MRCA (most recent common ancestor) within eight generations.” In plain English, this means that a definite YDNA pattern has been associated with her Morrison surname and with a common ancestor eight generations back. Noel and Ron Taylor were two early adopters of YDNA testing for their Taylor family project. Their first samples were submitted to the Sorenson Molecular Genealogy Foundation in 2000. The former president and currently the head of the board of trustees for the Taylor Family Society, Noel says that using DNA “caught the attention of many people in our organization….It renewed great interest in the hearts of many people who had been doing research for many years [who may have] lost interest and were somewhat discouraged.” The Taylors have made significant breakthroughs with their DNA testing. They have connected several Taylor lines back to a common ancestor, verified their paper trails, and even found a line of Hodges that were actually Taylors! That really is the bottom line. DNA, especially YDNA, can tell you things about the surnames in your pedigree that you can’t learn in any other way. If you haven’t yet, it’s time to jump on the YDNA bandwagon and see what your DNA has to tell you. Visit Diahan's website to learn about expert consultations with me. You’ll get customized guidance on which tests to order and how to maximize your results for your genealogy research.